The Magic Bait Minnow Trap This minnow trap from Magic Bait of Edmond, Oklahoma is a newer trap currently available in some bait stores and tackle shops. 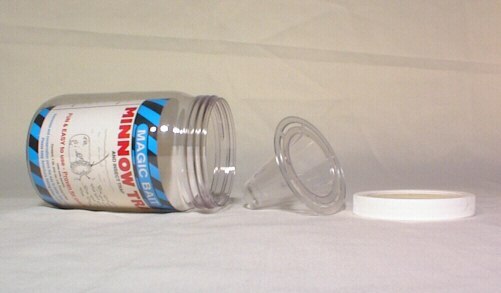 It is a quart size plastic jar with a removable funnel held in by a removable ring lid. It seems more of a novelty than a practical trap, but might catch enough minnows to fish with.